An architect’s rendering shows the zoning footprint approved for buildings in the Seaport Square project. A deal is emerging to build one of the South Boston Waterfront’s largest developments: a pair of 22-story towers on Seaport Boulevard that would include up to 800 apartments and a 300,000-square-foot retail and entertainment complex. The towers would be among the first major buildings at the long-planned Seaport Square project, a 23-acre complex that would eventually replace the district’s sea of parking lots with residences, office buildings, stores, restaurants, and public parks. Plans to build the towers across from the John Joseph Moakley US Courthouse have been on hold while the development team of MS Boston Seaport has searched for a financial partner. John B. Hynes III, a principal of MS Boston, confirmed he is negotiating a joint venture with Berkshire Group, a Boston-based owner and manager of multiple-family housing projects. If the deal is finalized, the partnership could move forward with construction early next year. It would be one of the largest developments yet on the fast-emerging waterfront, where several office and residential towers are under construction. Mayor Thomas M. Menino has named the area the Innovation District to help lure companies in the medical and technology sectors. In addition to the 800 ­apartments, the towers by Hynes and Berkshire would ­significantly boost the amount of retail and entertainment space in the ­area. The retail portion of the complex, which would be leased by ­W/S Development Associates, would include a large movie theater, restaurants, clothing stores and a ­variety of other shops. In recent years, developers have begun transforming many of the waterfront’s former industrial parcels into sleek office buildings, residential towers, and restaurants. But the area still lacks the essentials of a fully functioning neighborhood, such as a major supermarket. And many of its popular cultural and dining destinations are still divided by acres of windswept parking lots, many of which are in the Seaport Square footprint. Already, though, Skanska USA Commercial Development has purchased one of the project’s parcels along Seaport Boulevard and is planning to build a 400,000-square-foot office­ building there. Skanska is also teaming up with Twining Properties to build Watermark Seaport, a 300-unit apartment and retail building nearby. In addition Hynes’s firm, Boston Global Investors, and its partner, the investment bank Morgan Stanley, are funding construction of an innovation center to spur collaboration between companies in the district. The apartment towers by Hynes’s group and Berkshire would help to redefine the entrance to the neighborhood from downtown Boston. The apartments would range in size, with 15 percent of them set aside for low-income renters, per city requirements. Hynes declined to elaborate on the other features of the buildings, which are being designed by Elkus Manfredi Architects. Executives with Berkshire could not be reached for comment Thursday. The company owns or manages more than 100 housing complexes, accounting for about 32,000 apartments in markets from Philadelphia to Houston to ­Seattle. 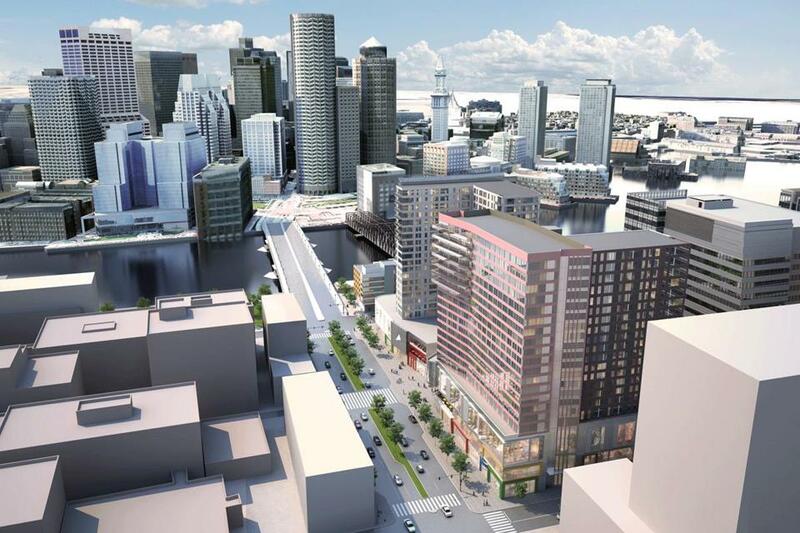 Before construction can proceed on the Seaport towers, the developers must obtain state environmental permits and design approvals from the Boston Redevelopment Authority.